Shopping for Bambi Film Cells? Features a print and actual cells of film from Disney's Bambi! Limited to just 2,500 pieces! Bring the quintessential coming of age story to your Disney collection. This charming film cell based on Walt Disney's Bambi features three prints of scenes from the film along with six film cells. 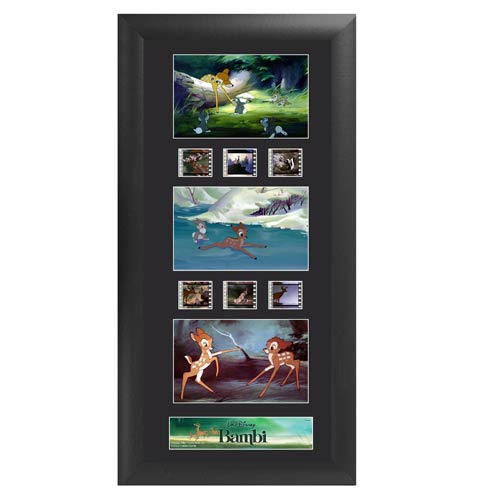 The Bambi Series 1 Trio Film Cell measures approximately 20-inches wide x 11-inches tall. This film cell includes a black mdf frame, a numbered limited edition name plate, and a Trend Setters embossed/foiled certificate of authenticity. Please note: The actual strips of film vary from piece to piece, as they are handpicked from reels of film. We cannot accept requests for specific strips, nor can we accept returns on opened items. The cell strips you receive may be different from those pictured. Each FilmCell presentation is made with careful attention to detail. It's double matted, placed in a quality frame, and contains a clear front and back allowing natural light to enhance the film frames. Each piece of film is hand cut from reels to provide you with the best possible scenes to offer a unique and varied product. All this is combined to bring you a collectible that looks great in any room.